Scenic pavement and dirt path that provides beautiful vistas of Fallen Leaf Lake and Lake Tahoe. Paddlewheel boat offering daytime and dinner cruises. Trail follows the ridges and mountain tops which circle around Lake Tahoe - 150 miles of hiking, mountain biking, and horseback riding trails. The castle offers tours in the summer months. For a feel of the "Old West" this stable offers horseback trail rides near Lake Tahoe. Ride on horseback along Lake Tahoe and experience the feel of the "Old West." Picturesque and narrow dirt bike trail with views of Lake Tahoe. This trail's steep drop of almost 1500 feet in under six miles makes it suitable for the experienced mountain biker. This 72-mile bike trail around Lake Tahoe provides scenic views. This paved trail is ideal for children and passes by scenic and historic sites. Paved bike path with views of Lake Tahoe. 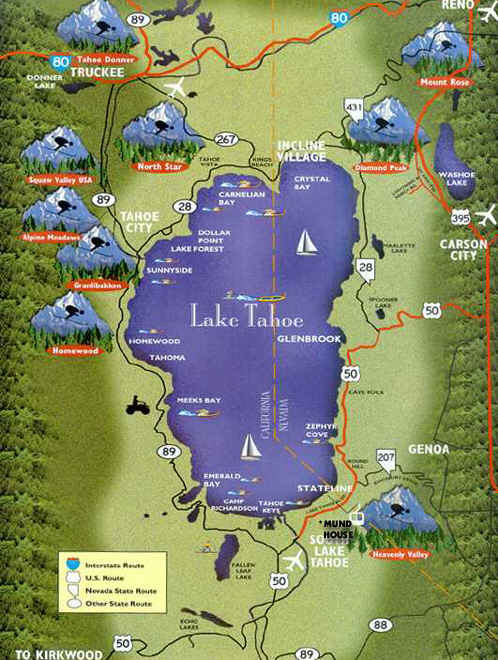 Six-mile hiking trail that culminates in a breathtaking vista of Lake Tahoe, Fallen Leaf Lake and High Sierra. This vehicle transports passengers to the scenic Tahoe Vista Hiking Trail. Scenic hiking trail where visitors can take a two-mile guided walk while learning about the wildlife and vegetation of the area. This body of water is scenically situated with a waterfall and mountain in the background and offers a hiking trail nearby. Located below scenic snow-covered mountain peaks and with a view of a waterfall. This easy to moderate hiking trail offers a scenic view of Cascade Lake and Cascade Falls. For an easier hike, this handicapped-accessible paved trail provides signs for a self-guided tour. This moderate to difficult hiking trail provides scenic views of the mountain peaks and a waterfall. This easy to moderate hiking trail passes Lower and Upper Echo Lakes as well as many other lakes. This moderate to difficult trail goes to Upper and Lower Eagle Falls and offers spectacular scenery. Nevada lake named for its large amount of eagles.